Search RB's catalog for books, videos, and more. Search for a book from other area libraries. 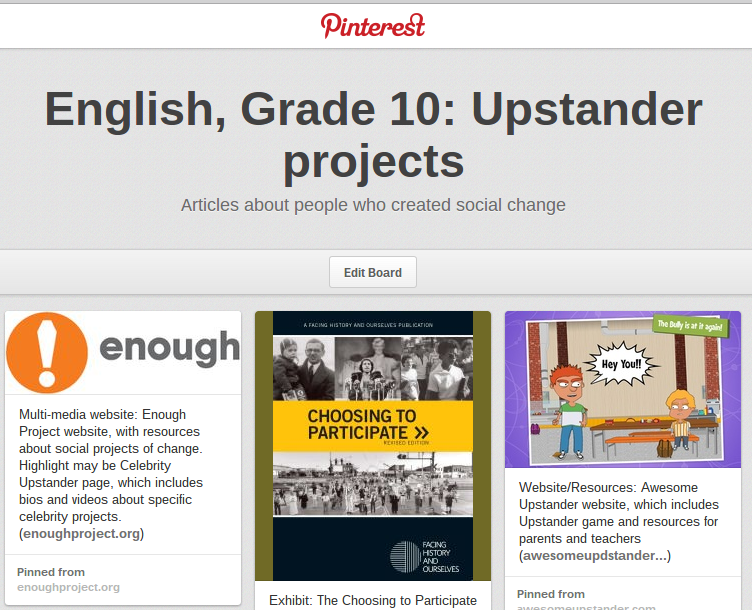 Check out this sample Pinterest Board for an English 10 unit on Upstanders. It includes links to websites, exhibits, videos, classroom activities, articles, graphics, and vocabulary. If you'd like help setting up a board, or if you'd like to give the library a topic and have us create a board for you, just let us know! Newsela: Choose the version of a non-fiction article that meets the reading level(s) your students'. Study Stack: Use pre-designed flashcards on a variety of topics, or create your own. Visual.ly: Design and explore unique posters and infographics. Screencast-O-Matic: Capture the images and/or video on your screen to create a video presentation, complete with voice-over. Pixlr-O-Matic: Add photo effects with this online darkroom. Ning: Create a private community for discussion forums and sharing. Feedly: Sign up to receive the latest news from all of your favorite websites. Evernote: Collect information online and organize it into clear categories, lists, and bookmarks. Diigo: Highlight, annotate, and organize anything you read online.